LAFS Annual New Year's Day Doubles returns on 1/1/18. Sign in by 10:45 for an 11:00 start. Bring-your-own-partner. We have rented the Lion's Club building at the top of the hill. No preregistration, sign up day-of. Please make sure to note that we are starting an hour earlier than previous years. Don't sleep in! 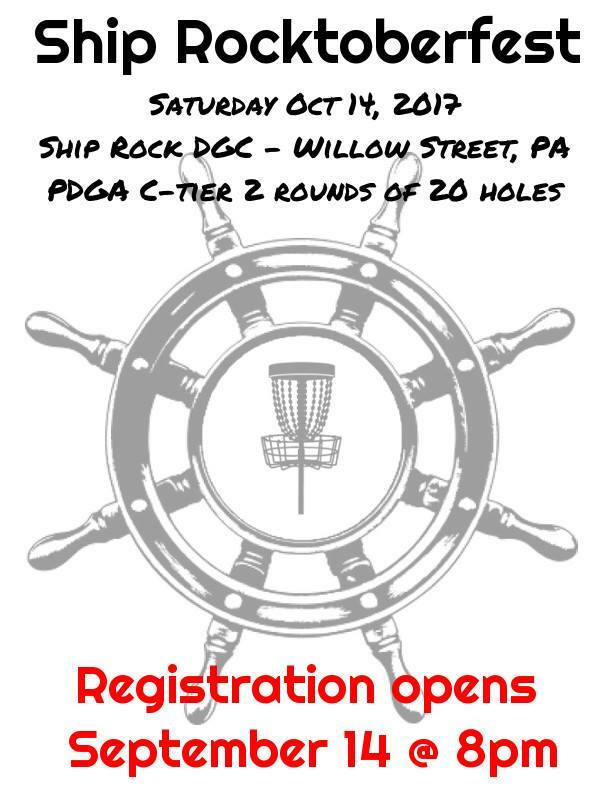 Lancaster's next PDGA event is Ship Rocktoberfest! Preregistration opens Thursday at https://www.discgolfscene.com/tourn…/Ship_Rocktoberfest_2017 . Sponsorship opportunities are available for this event. We are looking for local businesses, organizations, or individuals to sponsor a hole at Ship Rocktoberfest. Information is included on the form below. Contact us with any questions or for more information. LAFS singles leagues have wrapped up. Final tags will include both Conrad Weiser and Ship Rocktoberfest. Today, we can announce the winners of all the individual parks and the winner of the Handicap series. Overall Gold and Silver Tag winners will be announced after the final two events. Congratulations to all the winners! Now we move on to doubles and glows. Tuesdays and Thursdays in September we will have random draw doubles at Herr Park at 5:30. Tuesdays in October are glow at Buchmiller at 6:00. Tuesdays in November will be glow at Herr Park at 6:00. Glow formats will be announced prior to the rounds. LAFS Presents: Muddy Run Weekend, Featuring: The Holtwood Open PDGA C-Tier and Holtwood Open Doubles. Multiple events taking place September 8th-10th. Preregistration for both days opens August 9th at 8PM. Group primitive camping rates available via preregistration. 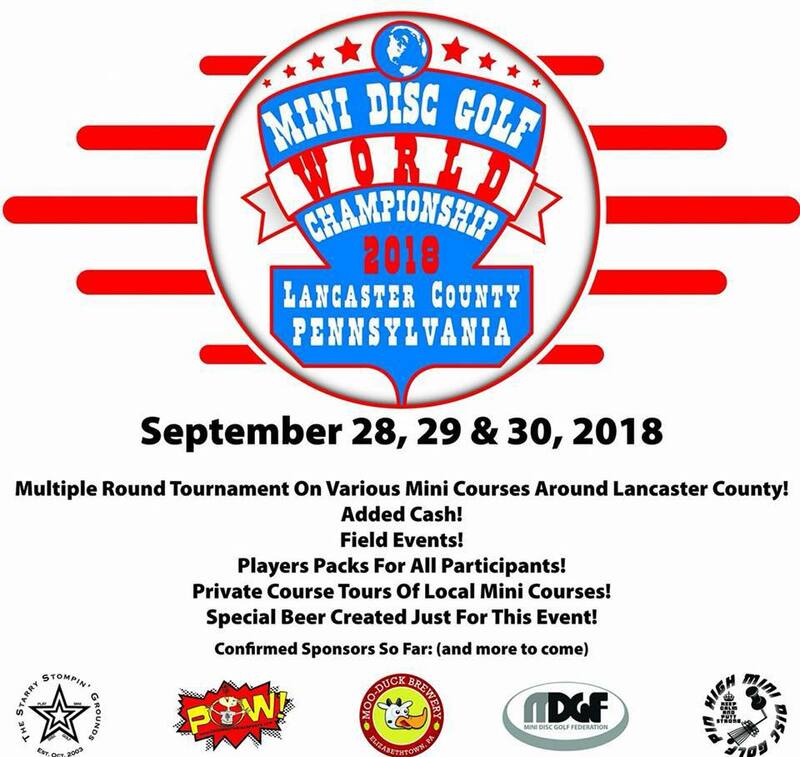 The Dynamic Discs RV is returning to Lancaster! Next Sunday June 25th at 2pm the RV will be coming to Herr Park DGC. We will be doing random doubles (mostly random, we will ensure that the teams are somewhat fair with some A/B formatting.) It's a good way to get discounted discs with a chance to win some free plastic and swag. No preregistration necessary. Thank you to our Summer Classic Sponsors! The Akron Summer Classic II is this Saturday, June 10, 2017. This PDGA B-Tier will have over $500 added cash thanks to our sponsors - Cornerstone Drywall and Lancaster Nissan. With over 40 years of combined experience in drywall installation, Cornerstone Drywall offers the quality service you need to get the job done on time and on budget. They work throughout Central PA, Maryland, and neighboring states. For more information, visit them at www.cornerstonedrywall.com. Lancaster Nissan offers new and used vehicles as well as financing options. They are conveniently located at 5340 Manheim Pike in East Petersburg, PA. Visit their web site - www.lancasternissan.com - to see what they have in stock. Thank you to both of our sponsors for their generosity! There are still spots available for the tournament, so sign up today! Attention league participants: We will be playing our Tuesday league rounds at Ship Rock from May 30 through July 11. After that, we will return to Buchmiller for the remainder of the season. Thursday nights will continue to be league night at Roland all year. See you on the course! Want to see what it's like to "Throw Gyro"? Come on out for the MVP Circuit Challenge at Herr Park on the morning of Saturday, July 1, 2017. The Circuit Challenge consists of a round of 18 (may be expanded to 20 if needed) holes of singles using only the three discs provided in the player's pack. Some holes may be modified as this is a beginner friendly event. Additional prizes (including multiple baskets) will be given out for divisional winners, in round CTP's, and winners of the side games which are included in the registration fee. Proposed side games include a Putting Challenge, Midrange CTP, and Long Drive Competition, all using only the provided discs. If we get over 50 people registered everyone will get a Macro Tesla and an additional side game will be added. Baggers will be bumped to their correct division if rating dictates it. Feel free to contact me through FB or email with any questions. PDGA B-Tier disc golf event. This tournament is a benefit for the family of Carl "Cubby" Cubbage, an area disc golfer who collapsed during a casual round and is now in the hospital in very serious condition. It was originally scheduled to be a Masters+ tournament, and we decided to leave it this way, as Cubby plays in the Advanced Grandmasters division (MG1). It is a "trophy-only" event, which means that all payout and player pack funds will go to Cubby's family. be part of the donation to Cubby's family. Pre-Registration for the 2017 Trilogy Challenge on June 3rd is currently open. The event will be held at Herr Park DGC, which recently had permanent tee pads installed. This event has sold out every year since it started in 2014, so be sure to secure your spot before it's too late! The Trilogy Challenge is the only way to get your hands on 3 brand new discs, that won't be released until the end of the season! Please Like & Share to spread the word. The Crosstown Shootout is in the books! We had another beautiful night at Buchmiller DGC for the weekly Tuesday Night Handicap League. 40 players turned out for the event, which featured the addition of another long basket to the regular short layout -- we're now up to playing #2 Long and #17 Long. Steve Heckel and Luke Haney tied for the top honors with an 8-under 46 -- however, since Steve came into the night with the lower tag, he walked away with tonight's top gold tag -- #3. Gold division scores were pretty tight tonight, with 3 players coming in at 47 (7-under), 3 players coming in at 48 (6-under), and 2 players at 49 (5-under). That makes 10 players within 3 strokes of the lead! On the Silver side, Glen Brodersen took the #1 tag with a decisive 49 (5-under), beating Will Tripp's 2-under 52 and Rich Saures' 1-under 53. Week #2 is in the books. Once again, Jimmy Fritsch smoked the course with a 12-under 42, but TJ Linton and Justin Weaver were hot on his heels with an 11-under 43 and a 9-under 45 respectively. Aaron Swarr took the #1 Silver tag with a 6-under 48, followed by Glen Broderson 3 shots back (3-under 51) and three players tied at 1-under 53. 2017 Leagues are off and running!! The Tuesday Night Handicap Leagues at Buchmiller Park kicked off this evening with 38 players filling the course for an early season run at the "Short" layout. Jimmy Fritsch came out firing and took the #1 Gold tag with an impressive 10-under 44, followed by Derrick Diffenderfer with an 8-under 46 and Travis Dombach with a 7-under 47. The #1 Silver tag went to Aaron Swarr, who crushed the rest of the Silver tag competitors with a 5-under 49, followed by Bud Andrew (even par 54) and Glen Brodersen (1-over 55). In total, we had 39 players on the course tonight, including three new tag members, Luke Haney, Justin Brinkman, and Marshall Hoellworth (I hope I didn't butcher anyone's name! ); and seven non-tag member guests. It's time to Meet Muddy Run! Join us on Sunday April 9th for a round of doubles. Bring your own partner at $40 per team. Preregistration opens March 8 on Disc Golf Scene. Sign up as a team. Muddy Run is open... and people are starting to notice!! Here's a quick video of a local player, Matt Hamilton, attacking one of the most picturesque holes on the course, the 737 foot par 4 16th hole -- The Bald Eagle! 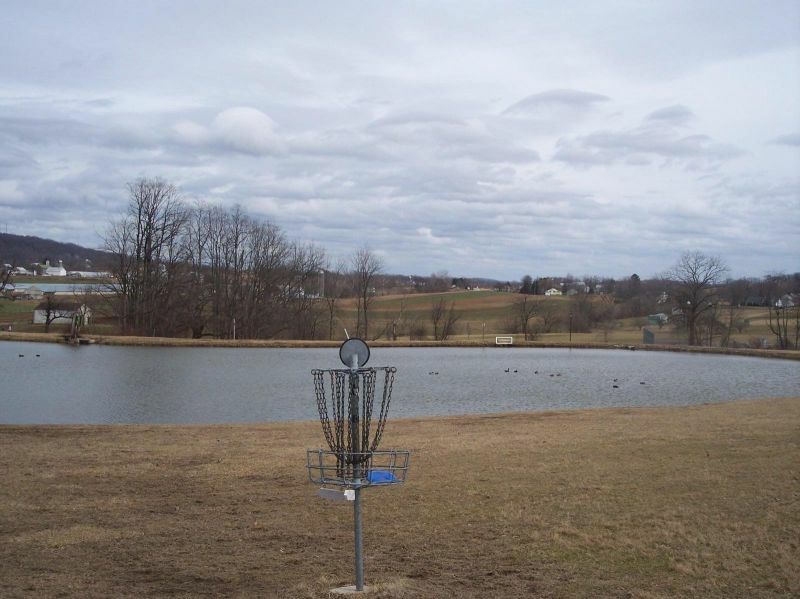 Lancaster County's newest course is now open! Muddy Run Disc Golf Course is now open to the public. There are gold and silver tees for most holes, with a mix of open and wooded fairways. At 9,044 feet from the gold tees, and with a total elevation change of 690 feet, this course has every challenge an upper level player could want. Narrow fairways. Protected greens. Challenging footing. And risk/reward decisions on almost every hole. For more information, check out detailed hole descriptions and a video walk-through here. The Disc Golf Course Review page can be found here.